I admit, I feigned more mystery about the mystery sternum in the last post than was actually present. Emily, who sent the picture, was thinking it was likely a loon, and I did question that since the angle was so bizarre, but it is, most likely, a loon. Somehow, the angle of the photo obscures entirely all the attachments of the ribs, which makes the sternum look as though those projections jut out much higher than they likely do in real life (or real death). Mainly, I wanted to show people how cool Aves3D is. And I was holding out for an emu or dodo. A girl can dream, right? Well, until Jim writes in and posts a photo in the comments that shows the similarities between Mystery Bird A and a Common Loon. So, Emily was right all along, and I will move onto Bird B. For Bird B, Mary Wright wrote in with an excellent walk-through of her i.d. The bird was identified as a jaeger by the original finder, Marcia Lyons, and Mary elaborated as to species. But first, how to get to jaeger. For me, it always starts with what the bird is not. We get a lot of gulls, eiders, that sort of thing on SEANET beaches, so when something like Bird B comes up, the brain jumps to common ones and tries to sort out why it’s not that. In this case, the wings are very much gull shaped, and the foot is reminiscent of a gull’s, but the coloration is unlike the gulls we typically see–dark above, but with white shafts on the primary feathers, and dark below as well, with a silvery white color to the underside of the primaries. The shape of the tail is also quite interesting: a wedge shape that generally brings to mind a cormorant, but this is most certainly not a cormorant. Shearwaters might come to mind, but the combination of very dark underwing contrasting with a white belly and breast defies the field guides’ shearwater section. Also, there’s still that weird wedge-shaped tail. Here’s that closeup of the upper wing again. At this point, one might be reduced, as I often have been in the past, to simply paging through a field guide to find other possibilities. That is how I happened on jaegers and skuas the first time we had one show up on a SEANET beach. They are in the same family as gulls, so luckily, I didn’t have to page far. Skuas are larger than what we have here with Bird B, and their upper wings show not just white primary shafts, but typically a much wider swath of white where the primaries meet the primary coverts. Our Bird doesn’t have that. Jaegers then. This feels encouraging until one drills down on jaeger i.d. Our three possibilities are Pomarine, Parasitic, and Long-tailed. If we could rule out even one, we’d be feeling much better about ourselves, and indeed, Mary points to the way to do so. Counting the number of white shafts on the upper side of the primaries, I can see six definitely, and it looks like a seventh partly hiding. That’s quite a lot of white-shafted primaries, as it turns out. 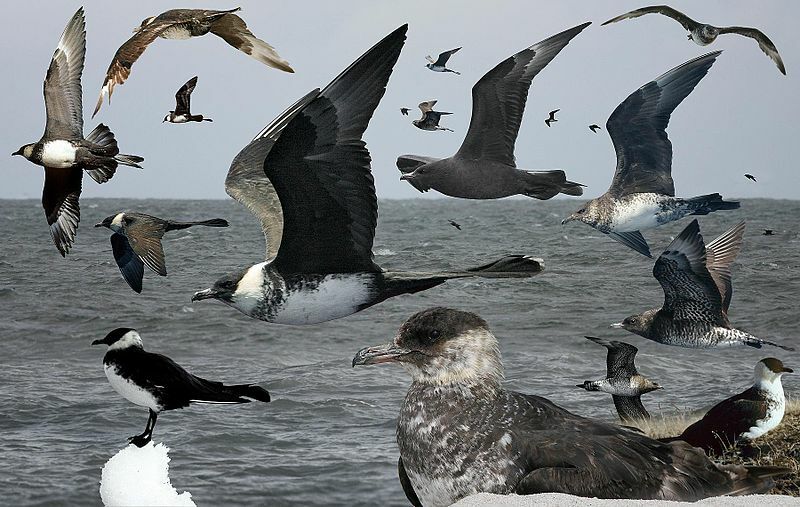 Pomarine Jaegers, especially young ones, are reported to have the most, with up to seven. Older Pomarines generally have fewer, but five or six is still typical. 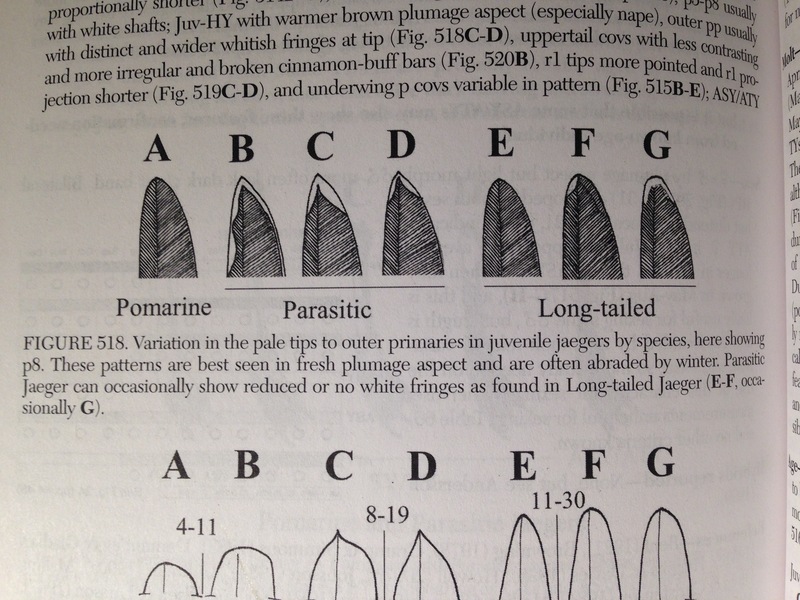 Parasitic Jaegers generally have only 4-5 of these white shafts, and Peter Pyle’s Identification Guide to North American Birds, vol. II tells me that again, juveniles have the most, with older Parasitics having as few as three. As Mary noted, Long-tailed Jaegers have only three white shafts, so our Bird B is wildly in excess of that. Based on the white primary shafts alone then, we might rule out Long-tailed and incline toward Pomarine, with Parasitic still in the running. Is there anything else we might glean from the wing tip alone, while we’re at it? Why yes! The tips of the primaries can give us some clues when looking at juvenile jaegers (and this assumes we are looking at a juvenile). Looking at the tips of these primaries, I don’t see any white or pale tips at all. If they were present, they could give us quite a clear idea what species this might be. Their absence, however, is not so definitive. Looking at this image from Pyle, we see two cases where white tips are entirely absent: Pomarine and some Long-tailed. Reading the caption, however, we see that even when the white tips were present once, they are worn down over time, especially over the winter. Our Bird B was found dead in December, so we might cautiously conclude that the slow grinding of time was not responsible for the darkness of Bird B’s feather tips, and that our bird actually started out that way. Again, this would incline us toward Pomarine, (or Long-tailed, if we are still entertaining that possibility) and away from Parasitic. But this assumes we are dealing with juvenal plumage to start with, so I don’t want to set too much stock by that. Juvenile jaegers of all sorts have extensive barring over the whole body, including the wings. Our Bird B is a much more solid color overall–sort of a gray brown without much barring to speak of anywhere. Also, if we look at the leg color, they appear to be entirely black. Young jaegers have gray legs with variable amounts of black on the toes and feet. 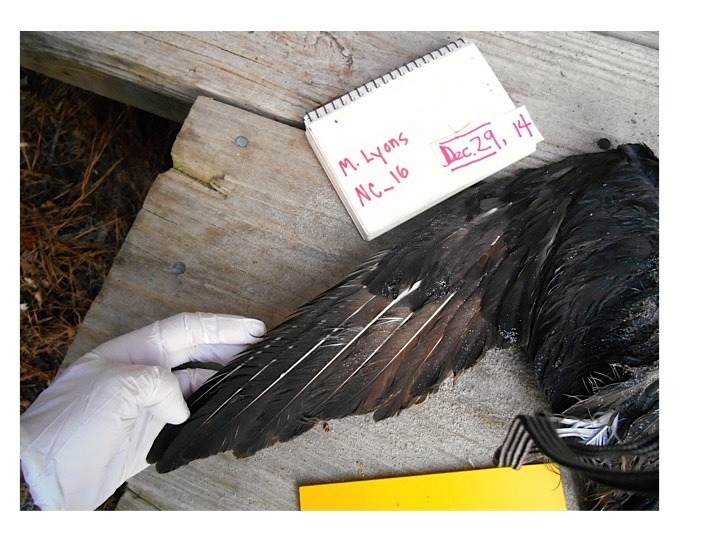 Adult Pomarine and Parasitic Jaegers have all black legs, whereas Long-tailed adults retain the gray on the legs. Score yet another point for ruling out Long-tailed. So why did I even mention points of identification for juveniles if the overall coloration and the leg color of Bird B show us that it’s an adult? Partly so I could show you how remarkable Pyle’s book is, with its exhaustive treatment of identification, but also partly because I was intrigued by a different feature of Bird B that struck me as juvenile-like and I wanted to find out more. That part is the rump. And upper tail coverts, if you must know. Here, we have a few tantalizing feathers to look at. Just three, lonely, white tipped feathers on the upper tail. Bird B is rather typically disheveled, for a dead, headless bird. But we can make out what looks like a whitish band on the upper tail (though this is quite possibly an artifact of dishevelment), and also three dark feathers with distinct white bands on their tips. Since the pattern of light barring on the upper tail is useful in differentiating juvenile jaeger species from one another, I wondered whether that barring disappears entirely in adults, or if any is retained. 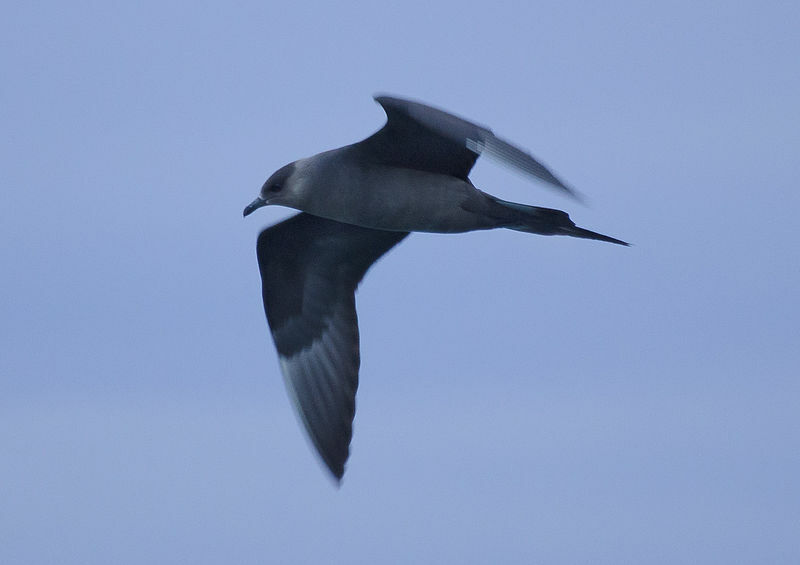 In searching the internet for clues, I found this beautiful shot of an adult Pomarine Jaeger in flight. You can see a few barred feathers on the upper tail here. Is this bird still in the last flush of youth then? Here’s another image, this one of another Pomarine in flight, but in this case, you can see all the spangling and barring on the underwing and flanks, which tells us that this is indeed a young bird, only partially in possession of its adult plumage (like that very grown-up yellow wash on the head). Here’s one last, of a breeding Pomarine Jaeger showing no barring on the upper tail at all. Are the barred upper tail feathers among the last to go then? That might explain the other juvenile features of our Bird B, such as the rather outrageous number of white-shafted primaries, typical of youngsters. The pale bands we see appear much more white than buff or cinnamon, which would be typical of a Parasitic. Again, then, I am leaning toward Pomarine on that count. Now, how about that tail? 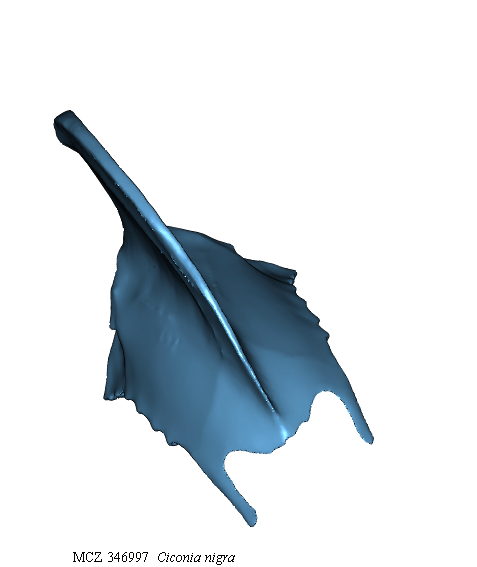 Overall wedge-shaped, but our Bird B has two central feathers longer than the rest. This is a typical jaeger thing, but the exact shape and length of those two feathers can be helpful in deterring which species we have. Unfortunately, our Bird B’s central tail feathers (or rectrices) are beat up, so their former shape is close to indeterminable. In breeding adults, there are big variations between the three species. 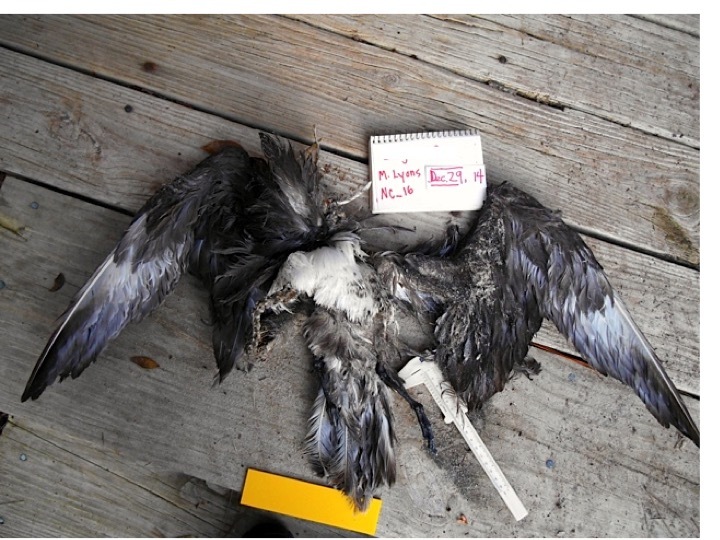 In juveniles, and also in non-breeding birds, the differences are less distinct, and that is the sort of case we have here, especially since, if this bird died in December, it was really transitioning between juvenile and adult plumage at that point. 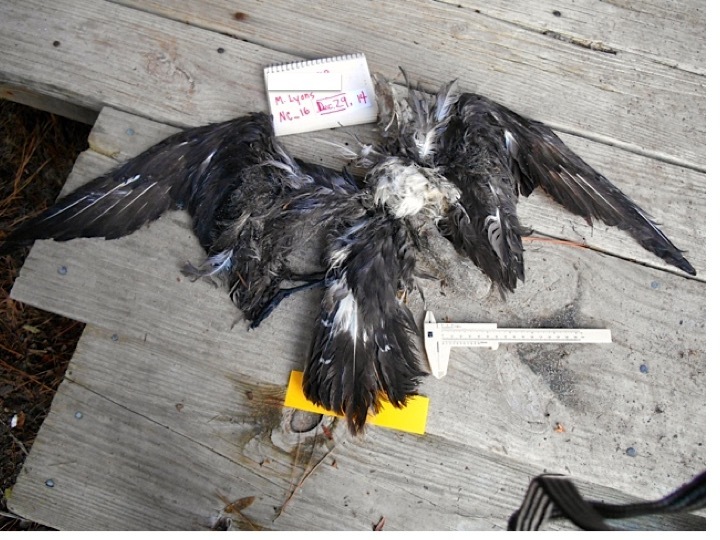 Overall, Parasitic Jaeger juveniles have pointed central rectrices, while Pomarine have blunt ones. I can’t honestly tell which we have in Bird B. Finally, there is a feature of the underwing that can be helpful in telling apart the Pomarine and Parasitic that we might look to. In the Parasitic, there is a white band running along the primaries where they meet the underwing primary coverts. The Pomarine has this too, but also has an additional pale band that runs along the bases of the primary coverts. These features combined give the “double flash” appearance that Mary mentioned in her response. If you look at their respective underwings at the Slater collection here and here, you may be able to pick up on it, and also see how subtle it can appear. Pomarine Jaegers of all ages and stages. Do you see the double flash? I’m not sure I do. Photo: Crossley Guide via Wikimedia Commons. So, after all that hemming and hawing, I feel that the weight of the evidence falls toward Pomarine, though not by a whole lot. Also, Mary is rather a good birder, and I am not, so I am still troubled by our failure to agree on this point. If we had the head, we’d be in much better shape, but we at SEANET are not accompanied to such luxuries. There is a certain spartan pride in that. This latest quiz was a challenge, not least for me. Mary Wright wrote in about Bird A (just a sternum actually) saying that she has no idea, and I felt the same. 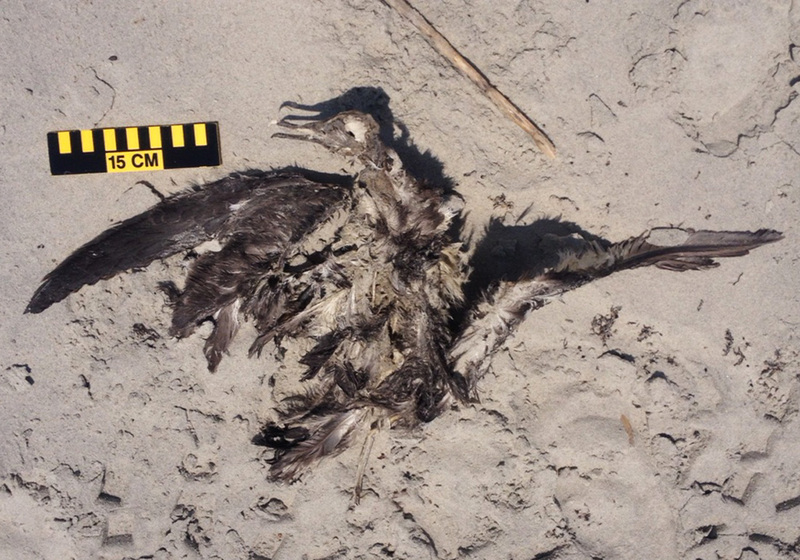 I admit, as a seabird oriented sort of person, I am blindered to the other orders of birds, and there is no reason this has to be a seabird, just because it was found on a beach. I have tried to keep my mind open in terms of identifying this sternum, but it may still not be open enough. Luckily, we live in an era of complex algorithms where computers can do many sorts of work, including identification of images. Unluckily, I operate in a less technical world where I like to utilize the “shot in the dark, based loosely on gut feelings,” technique of identification. Understanding this, let us begin. Bird A: Found in North Carolina. It’s a bit diffcult to gauge the size of this sternum, given its angle, and it is both foreshortened and enlarged by the camera. These distortions are a complication. I don’t really want to venture any guesses as to size, so I am doing what I can with shape. The first thing that jumped into my mind was a pouch bill like a pelican, perhaps. What bothered me about this is that pouch bills very often have a furcula (or wishbone) that is fused to the forward point of the keel. Where the fingers are gripping the tip of the keel, there appears to be nothing attached, nor a broken end of any sort. This does argue against pelican and friends. There are also those projections curving off the lateral surfaces of the sternum. Those are odd, and not something in keeping with any of the standard issue seabird keels I look at all the time. 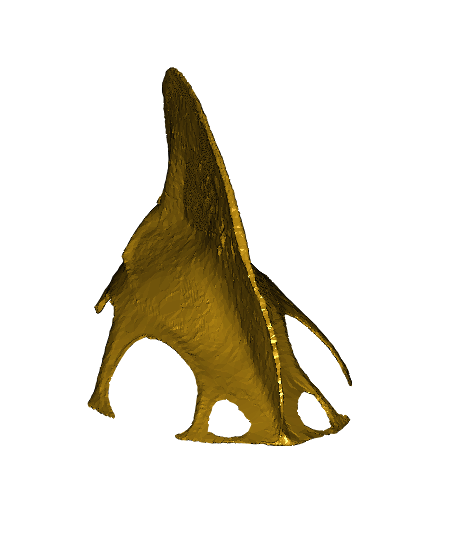 There is a keel, but it tapers off about mid sternum, so that the back end of the sternum is pretty flat with no central ridge. This caught my eye as well, since most birds we deal in have a continuous ridge all or most of the way to the back end of the sternum. Sternum of a Scaled Pigeon. Photo copyright Harvard Museum of Comparative Zoology and Aves 3D. In this pigeon, the keel is much more prominent, which is typical of birds that use fast, flapping flight. The keel is very large in order to provide attachment for the robust pectoral muscles. The keel, then, is very much unlike Bird A’s. But this pigeon does show the lateral projections of Bird A, and I have struggled to find many other birds that possess such a feature. 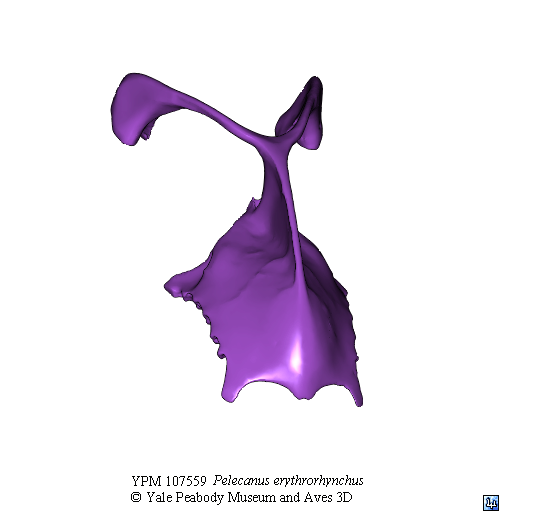 As I browsed through Aves3D, selecting birds fairly well at random, I came across this Black Stork. Black stork sternum. Photo copyright Harvard Museum of Comparative Zoology and Aves 3D. I include this one mainly for the rounded silhouette of the back end of the sternum, which is very like our Bird A. Bird A lacks those longer, rearward pointing projections, but Bird A’s sternum looks rather weathered, and those long bits are often the first to snap off, so we should entertain the idea that we are missing some bits. In the end, I remain puzzled. It’s summertime, so response rates to the DBQs are in their usual summer slump. I may recycle this one at a later date, or, I may just watch many, many more hours of my life get swallowed up by playing with images on Aves 3D. If you decide to do the same, be aware that I had to update my Java, and also change some weird security certificate on my computer in order to be able to view the images. Hopefully, you will have a smoother ride. Tomorrow, I will post the answers for Bird B. I know, you can’t bear the suspense! But you must. Because I have to take my kid to summer theater camp. The glamour! Here are some unusual bits for you, dear Seanetters. The first came to me from my friend and colleague Emily Christiansen. 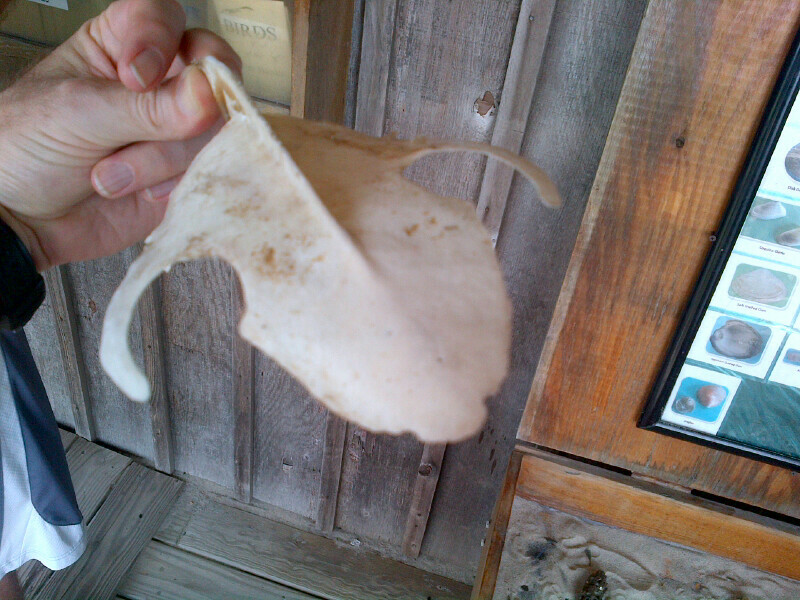 It is a bone found on Pea Island in North Carolina. I wonder what you all think it might be? Here are the shearwaters you ordered. Brand new Seanetter Tonya Lee found a GRSH on her inaugural walk in NC! Indeed, it is normal, but as you can see from this note, it is not consistent in magnitude from year to year. 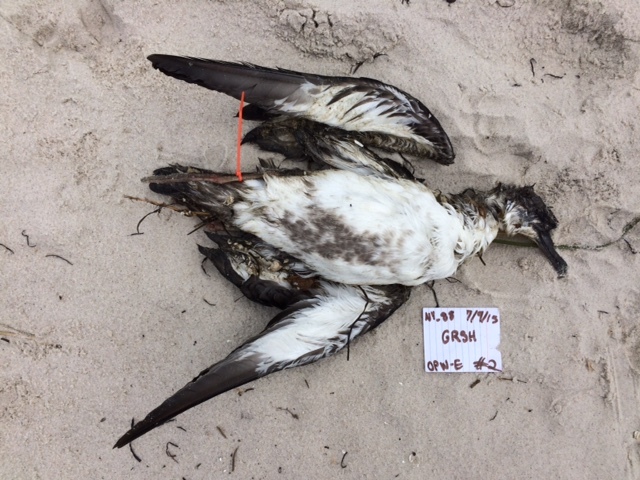 On SEANET beaches, we start seeing Great Shearwaters on our southern beaches in June, and by July, Seanetters are finding them all the way up through Massachusetts. Though the birds turn up every year, their numbers vary. This summer does appear to be a bigger year, though not by much based on our data alone. Last summer, we had a total of seven carcasses across all beaches. As of today, we’ve had ten reported, though numbers of GRSH always taper off by the end of July, so I don’t expect to see many more. In 2013, we had only three GRSH turn up. Which of these is “normal?” I don’t know. The National Parks Service SEANET team on Fire Island have found quite a few this year. I was honored to contribute a bit to a paper on the subject that mentions all the complicating factors–are we just looking harder now than we used to? Possibly, though at least over the past few years, SEANET data has been consistent. We will have to see if any long term trends emerge over the next ten years of Seanetting, but right now, it looks like shearwaters have good years and bad years, mainly hinging on the weather. There are always the marginal individuals that, in a good year, may eke out a living, and in a bad year not. It’s been a whirlwind couple of weeks for me, dear readers. We crammed a lot of vacation into a short span. 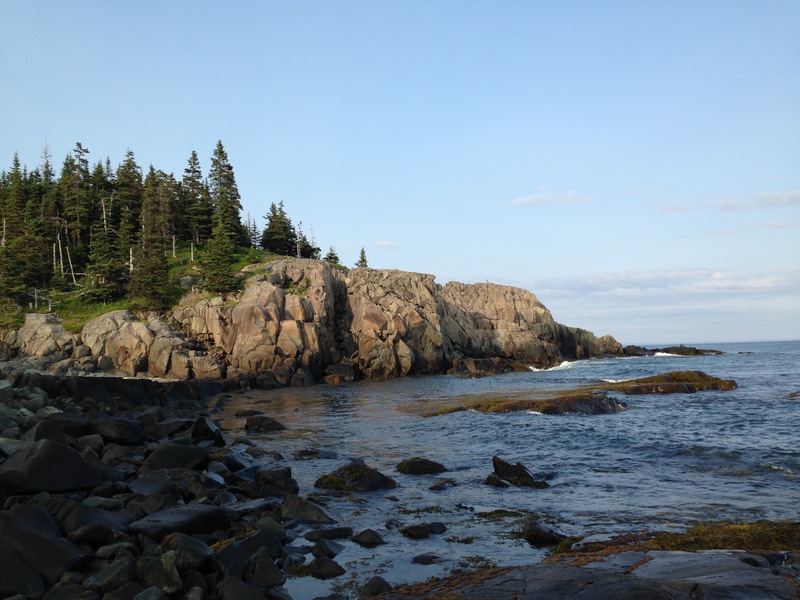 After a stint in northern New Hampshire camping, we headed to the easternmost point in the United States, to hike the fogbound coast in Lubec and Cutler Maine, Way Downeast, as the region is known. We even briefly set foot in Canada, on Campobello Island, summer home of the FD Roosevelts. Now, it’s back to the grindstone for a few weeks before we take off again for two weeks in central Maine. I have to bank these memories for the dark days of winter when my teaching job consumes almost every hour, bleeding into evenings and weekends. Ah, summer. Here are a couple of gratuitous photos from the end of the (American) world. Next post, back to business. 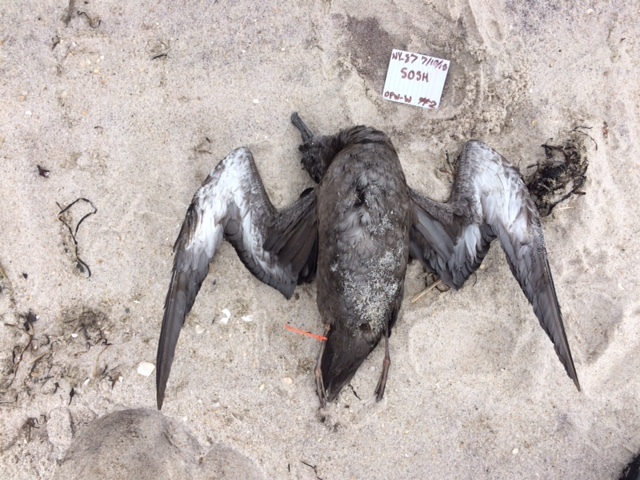 And dead shearwaters. Backpacking on the Cutler Preserved Lands. 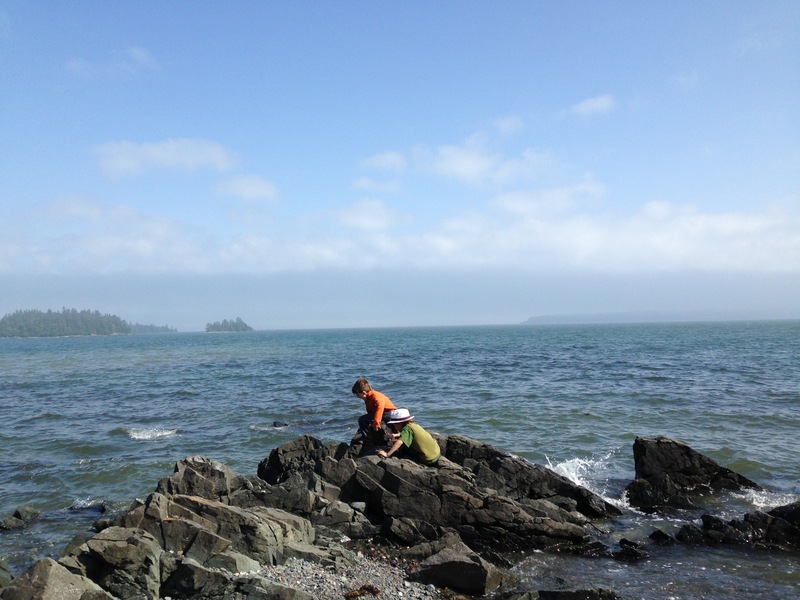 Scrabbling on the shores of Campobello.